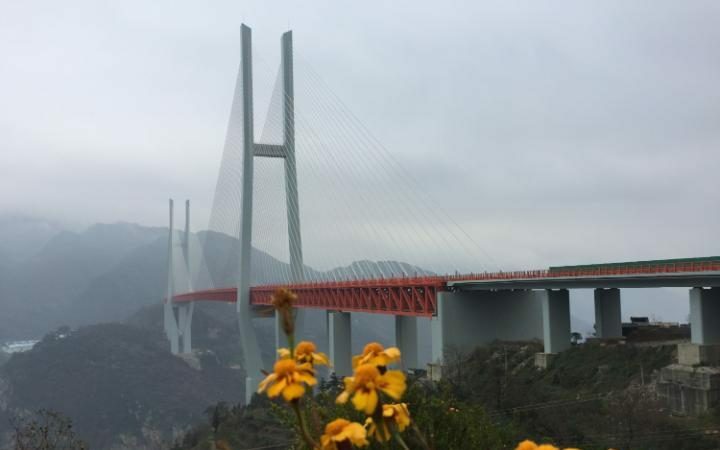 A bridge in China suspended over a 1,854-foot gorge became the "world's highest" when it opened to automotive traffic Thursday, 29th Dec. 2016, in a remote, mountainous part of China, adding to the country’s impressive roster of megastructure. We know what you're thinking: $146.7 million is cheap! And it is! After all, when the Golden Gate Bridge spanning San Francisco Bay was built in 1933 it cost $1.5 billion (in adjusted dollars), and the brand new New Bay Bridge, on the other side of town, ended up costing a whopping $6.7 billion when it was finished in 2013. 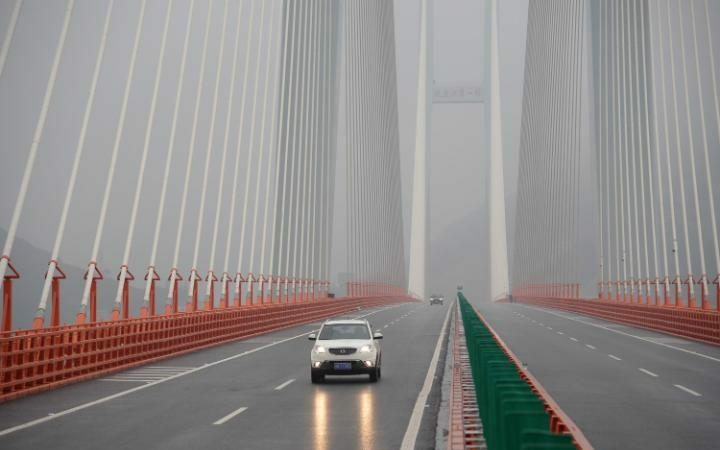 The Beipanjiang Bridge is part of the 2,115 mile Hangrui Highway which connects Hangzhou to the China-Myanmar border crossing in Ruili. Construction actually finished on the bridge September 10, but the massive sky-scraping overpass only opened to vehicular traffic today. The Beipan river, over which the Beipanjiang Bridge carries traffic, is part of the great Pearl River basin. Because of its geography, the bridges that cross it tend to be remarkably high. The bridge is in a remote, mountainous part of China, a few miles downriver of the enormous Guangzhao Dam. The Guangzhao Dam is a concrete gravity dam a few miles north of the Beipanjiang Bridge, designed to generate electricity using hydroelectric power generation. The Beipanjiang is the highest rather than the tallest bridge. The tallest bridge - the bridge with the tallest structure, regardless of distance from the valley floor - remains the Millau Viaduct, a joint British-French venture on the A75 Autoroute. 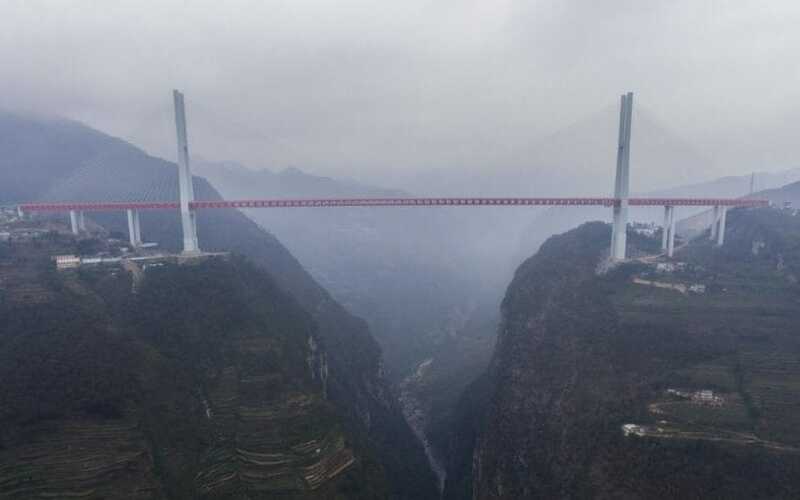 The road deck here is held a mere 270 metres – less than half the height of the Beipanjiang Bridge. China is also home to the second and third highest bridges - the Sidu River Bridge and the Puli Bridge, respectively - as well as other modern wonders such as the Three Gorges Dam (and its ship lift, the world’s largest) and growing high speed rail network.